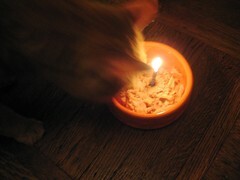 On your cat's birthday, when you think it would be cool to give her a can of tuna with a candle stuck in it, don't put the dish with the tuna and the lit candle on the floor and try to take a picture of the cat looking at her "birthday cake" for your blog. In your cat's tuna-induced excitement she will have complete disregard for the open flame, and will burn off the lovely long whiskers above her eyes. She will soon forget about this little mishap, but you'll be reminded every time you see the singed hairs, and you'll feel very, very guilty. My mom's cat is a moron. She loves the smell of candles and seems to have a hard time keeping her whiskers at proper growth.